Our Engineering Materials and Metallurgy Tests allow you to experience an online examination in the real-time environment. In every online test on Engineering Materials and Metallurgy, you will be presented with Multiple Choice Questions (MCQs) which will test your skills in Engineering Materials and Metallurgy Concepts in a detailed and comprehensive manner. In the test, each question will have 4 options to choose from. You should select only 1 correct option as an answer and then move on to the next question. Once you submit answers to all the questions, you will be given your final test score. In the Online Engineering Materials and Metallurgy Test, for every correct answer, you will be given 2 points. There will also be negative marking of -1 for every wrong answer. So, you will have to be more careful in choosing the answers to the question in your online examination. If needed, you should skip to the next question and come back to the previous question later so that you can do proper time management for the online mock tests. 1. "Engineering Materials and Metallurgy Practice Tests" - In Engineering Materials and Metallurgy practice tests, there will be a series of practice tests wherein you can test your Engineering Materials and Metallurgy concepts on every chapter separately. There will not be any time limit on these tests. So, Engineering Materials and Metallurgy Practice Tests should be the first set of tests which you should attempt. Goto these practice tests here. 2. 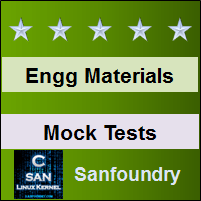 "Engineering Materials and Metallurgy Mock Tests" - In Engineering Materials and Metallurgy mock tests, there will be a series of mock tests wherein you can test your Engineering Materials and Metallurgy concepts on every chapter separately, but there will be a fixed time limit per test. So, it is similar to Engineering Materials and Metallurgy Practice Tests, but with an added constraint of time limits. You should try Engineering Materials and Metallurgy Mock Tests if you are appearing for any online examination soon. Goto these mock tests here. 3. 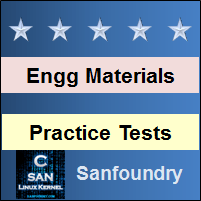 "Engineering Materials and Metallurgy Certification Test" - Once you are through with your Engineering Materials and Metallurgy concepts, then you should try our Engineering Materials and Metallurgy Certification Test wherein Sanfoundry will issue a free Certificate to you if you scored either Grade A* or Grade A in Engineering Materials and Metallurgy Certification Test. Goto Engineering Materials and Metallurgy Certification test here. 4. "Engineering Materials and Metallurgy Internship Test" - If you are interested to do Internships in Engineering Materials and Metallurgy at Sanfoundry, then you must take our Engineering Materials and Metallurgy Internship Test. If you scored either Grade A* or Grade A in Engineering Materials and Metallurgy Internship Test, then you are eligible for Internship at Sanfoundry in Engineering Materials and Metallurgy. Goto Engineering Materials and Metallurgy Internship test here. 5. 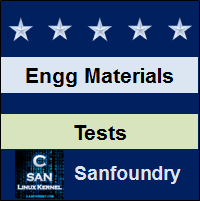 "Engineering Materials and Metallurgy Job Test" - If you are a fresher, a dropout, an experienced person and if you know Engineering Materials and Metallurgy well and looking out for jobs in Engineering Materials and Metallurgy domain at Sanfoundry (or our Network of Companies), then you should try and qualify our "Engineering Materials and Metallurgy Job Test". 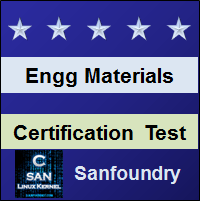 If you scored either Grade A* or Grade A in Engineering Materials and Metallurgy Job Test, then you are eligible for a Job at Sanfoundry (or our Network) in Engineering Materials and Metallurgy domain. Goto Engineering Materials and Metallurgy Job test here. For every "Engineering Materials and Metallurgy Practice Test", Total Questions: 20, Total Time: Unlimited. For every "Engineering Materials and Metallurgy Mock Test", Total Questions: 20, Total Time: 20 Minutes. For "Engineering Materials and Metallurgy Certification Test", Total Questions: 50, Total Time: 1 hour. For "Engineering Materials and Metallurgy Internship Test", Total Questions: 50, Total Time: 1 hour. For "Engineering Materials and Metallurgy Job Test", Total Questions: 50, Total Time: 1 hour. Before you get started on these series of online tests on Engineering Materials and Metallurgy, you should learn, study and practice our collection of 1000 MCQs (Multiple Choice Questions and Answers) on Engineering Materials and Metallurgy here. We also prefer that you should practice Engineering Materials and Metallurgy practice tests and mock tests completely before attempting the certification test. Here is the list of online practice tests and mock tests on Engineering Materials and Metallurgy. Each online test focuses on a "Specific chapter of Engineering Materials and Metallurgy". So, you should try both practice test and mock test on every chapter to do a self-assessment of your knowledge (along with time-limit constraints) in every area or sub-topic of Engineering Materials and Metallurgy. Engineering Materials and Metallurgy Certification test, Internship test, and Job Test are mentioned at the end of this list. 1. Engineering Materials and Metallurgy Test 1 – This set of online test on “Engineering Materials and Metallurgy” tests your skills on Mechanical Properties, Thermal Properties, Electrical Properties, Miscellaneous Properties, Fick's Law, Carbon Steels, Alloy Steels, Stainless Steels & Other Steels, Cast Irons, Aluminium and its Alloys, Zinc and its Alloys. 2. Engineering Materials and Metallurgy Test 2 – This set of online test on “Engineering Materials and Metallurgy” tests your skills on Copper and its Alloys – 1, Copper and its Alloys – 2, Bearing Materials, Magnesium and its Alloys, Miscellaneous Alloying Elements – 1, Miscellaneous Alloying Elements – 2, Polymers and Polymerization, Polymer Additives, Ceramics – 1. 3. Engineering Materials and Metallurgy Test 3 – This set of online test on “Engineering Materials and Metallurgy” tests your skills on Ceramics – 2, Thermoplastics – 1, Thermoplastics – 2, Thermosetting Plastics, Particle Reinforced Composites, Fibre Reinforced Composites & Other Composites, Protective Coatings, Ceramic Formation & Clay Ceramics, Abrasives, Silicate Structures and Polymorphism. 4. Engineering Materials and Metallurgy Test 4 – This set of online test on “Engineering Materials and Metallurgy” tests your skills on Properties of Refractories, Refractory Materials, Superalloys, Polarisation and Dielectrics, Ferro, Para and Dia Magnetic Materials, Soft and Hard Magnetic Materials, Properties of Insulation – 1, Properties of Insulation – 2, Insulating Materials – 1, Insulating Materials – 2. 5. Engineering Materials and Metallurgy Test 5 – This set of online test on “Engineering Materials and Metallurgy” tests your skills on Insulating Varnishes, Nylon, Teflon and Fiber Glass, Glass Wool and Thermocole, Petroleum and its Products, Cements, Metallurgical Coke and Synthetic Resins, Types of Glasses and their Properties, Glass Production and Processing, Structure and Properties of Elastomers. 6. Engineering Materials and Metallurgy Test 6 – This set of online test on “Engineering Materials and Metallurgy” tests your skills on Types of Rubbers, Vulcanization and Forming of Rubber, Adhesion Process and their Types, Crystal Defects, Types of Corrosion and Oxidation, Corrosion and Oxidation Control, Types of Fracture, Fracture Toughness, Protection against Fracture, Plastic Deformation, Mechanisms of Creep & Creep Resistant Materials, Elasticity, Relaxation Processes and Spring Dashpot Models. 7. Engineering Materials and Metallurgy Test 7 – This set of online test on “Engineering Materials and Metallurgy” tests your skills on Cryogenics, Hot and Cold Working of Metals, Defects and Machining of Metals, Solidification of Metals, Nucleation, Growth and Segregation, Recovery, Recrystallisation and Grain Growth, Thermometry and the Types of Thermometers, Pyrometry and the Types of Pyrometers, Metallography, Phases and Phase Diagrams, Iron-Carbon System and their Alloys. 8. Engineering Materials and Metallurgy Test 8 – This set of online test on “Engineering Materials and Metallurgy” tests your skills on Iron and Iron Carbide System, Transformation of Steel and Cast Iron, Hume Rothery's Rules, Types of Solid Solutions, Types of Solids, Crystal Structures and Lattices, Diffraction, Bonding in Solids, Annealing – 1, Annealing – 2, Normalising & Quenching. 9. Engineering Materials and Metallurgy Test 9 – This set of online test on “Engineering Materials and Metallurgy” tests your skills on Transformation Diagrams, Hardening and Hardenability, Tempering, Interrupted Quenching, Carburizing, Nitriding, Cyaniding and Carbonitriding – 1, Nitriding, Cyaniding and Carbonitriding – 2, Selective Hardening, Welding. 10. Engineering Materials and Metallurgy Test 10 – This set of online test on “Engineering Materials and Metallurgy” tests your skills on Soldering and Brazing, Pattern Making, Mold Making, Casting Processes, Sintering and Compacting, Pig Iron and its Manufacture, Metal Composition Testing, Inspection of Materials, Impact Tests on Metals, Fatigue Tests, Hardness Tests on Metals, Mechanical Tests on Metals, Protection Against Wear, Metal Spraying and Hard Facing, Age Hardening. 11. Engineering Materials and Metallurgy Certification Test - This set of online free certification test on "Engineering Materials and Metallurgy" tests your skills on all areas (all chapters, topics and subtopics) of Engineering Materials and Metallurgy. 12. 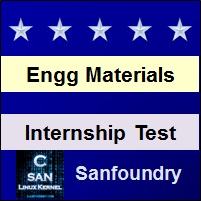 Engineering Materials and Metallurgy Internship Test - If you scored either Grade A* or Grade A in our Engineering Materials and Metallurgy Internship Test, then you can apply for Internship at Sanfoundry in Engineering Materials and Metallurgy. 13. 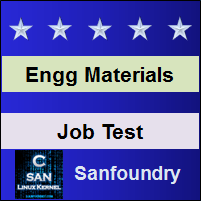 Engineering Materials and Metallurgy Job Test - If you scored either Grade A* or Grade A in our Engineering Materials and Metallurgy Job Test, then you can apply for Jobs at Sanfoundry in Engineering Materials and Metallurgy domain. Best Wishes for your Engineering Materials and Metallurgy Tests!